The other day, I was on the verge of having another anxiety attack — the same kind that I wrote about in my book The Happiness Dare. I could feel it coming on — an overwhelming sense of heart-pounding panic, difficulty breathing, dizziness. There wasn’t any one thing that set me off, just a long train of emotional rail-cars carrying the cargo of daily demands, losses, and this impending feeling of doom in our world. I could hear the newscasters on the television in the living room. The day’s stories sounded like yesterday’s stories — and none of it was good. And then I kept saying those three words; it felt like I was calling down the power of heaven. Thank you, Lord. Thank you, Lord. Thank you, Lord. The words formed a defense in my mind, pushing back the panic. In the last two years, I’ve learned a lot about what it takes to cultivate happiness in our lives. Nothing has been more effective than simply saying thanks. It begins by recognizing the gifts we’ve already been given, and then taking the time to be grateful for them. Gratitude is more than a nice gesture acknowledging the gifts in our lives. It is the stubborn refusal to be held hostage by fear and despair. It’s saying to the world — and to ourselves — that despite everything, this old world is still a beautiful place. No matter how hopeless it all seems, there’s always, always something to be thankful for. We can be grateful in times of hopelessness because we are gripped at all times by God. Cicero said that gratitude is not only the greatest of virtues, but the parent of all others. If that’s true, then my happiness does not cause me to be grateful for what I have. My gratitude for what I have causes me to be happy. Gratitude births the virtue of happiness. On that awful day when panic swept over me, I chose gratitude. Gratitude often plays a starring role in the talks I deliver at retreats and conferences. Why? Because thankfulness works. I often issue a challenge to those in the audience: Count three blessings a day, for one week, and then go back and review all 21 blessings at the end of the seventh day. When we do that — count our blessings, and then review them — we experience two extra kinds of happiness. 1 – We experience “anticipatory happiness,” when we begin to scan our environment for the good. We train our brains to focus on what is right, instead of what is wrong. 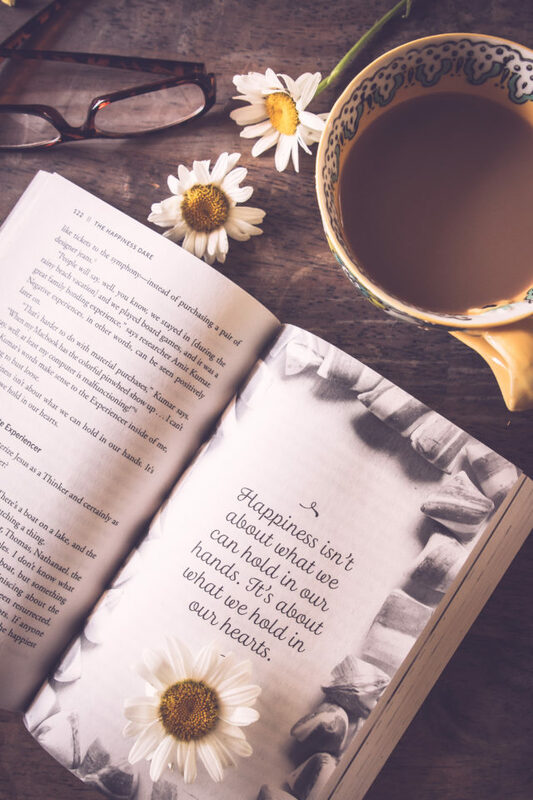 2 – We experience “residual happiness” — a sort of after-the-fact happiness, when we take the time to write it down and review it later. Last week, a woman contacted me to tell me that she had taken me up on the challenge to count three blessings each day, for seven days. But she’d taken the challenge one step further. She invited her granddaughter to do the same. And every night, they texted their gratitude lists to each other. 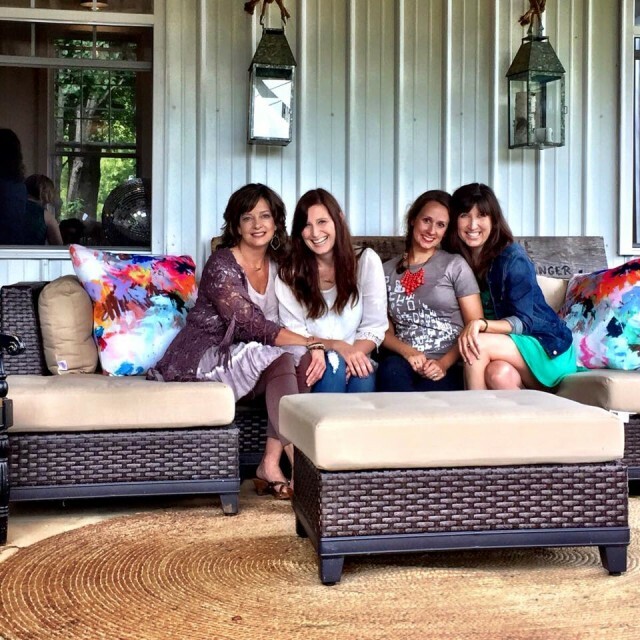 Bonnie has been texting her granddaughter Courtney nightly with her list, which includes things like: a loving husband who knows Jesus; having children and grandchildren who live close; the ability to work; living in a community where people serve God. 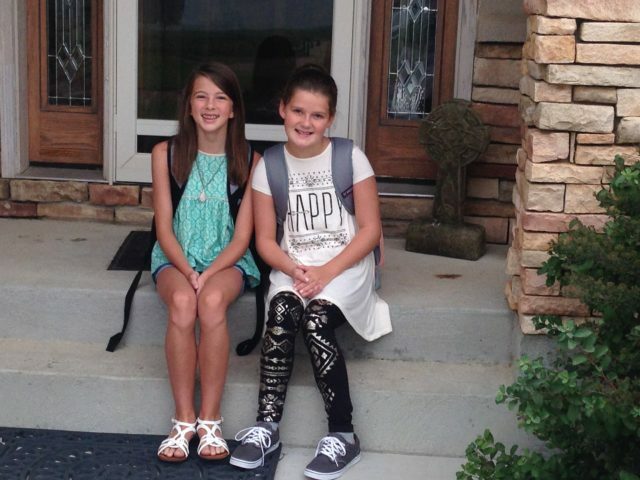 Courtney texts back with her own list: a compliment from a friend at school, her healthy 4-H calf, her smile. Maybe we could do the same. Maybe we could count our blessings for the next seven days, and invite a friend to join us! Thanksgiving is almost here. What if we got an early start? What if we joined together, and committed to 7 days of choosing gratitude? Furthermore, what if we invited a friend, a granddaughter, a mother-in-law, or a sister to take the challenge with us? That’s the heart behind the 7 Day Challenge to Choose Gratitude & Find Happiness. and help each other choose gratitude. It’s so easy to be a part of this! 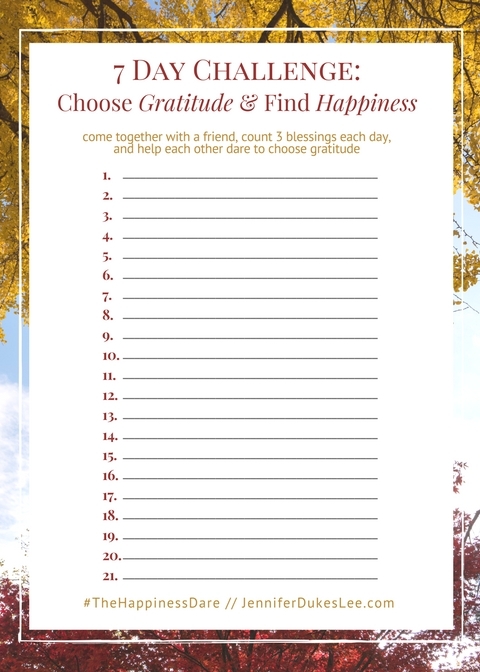 1 – Click and print the FREE gratitude list, found right here. 2 – Invite someone to join you. Who? Your mom, your prayer partner, everyone in your book club, your whole office! 3 – Every day, for seven days, each of you will scan your world for the good that is already there. Each person records her three daily blessings on her own list. 4 – Hold each other accountable. Text, call or Facebook message each other every night to report in with your blessings! 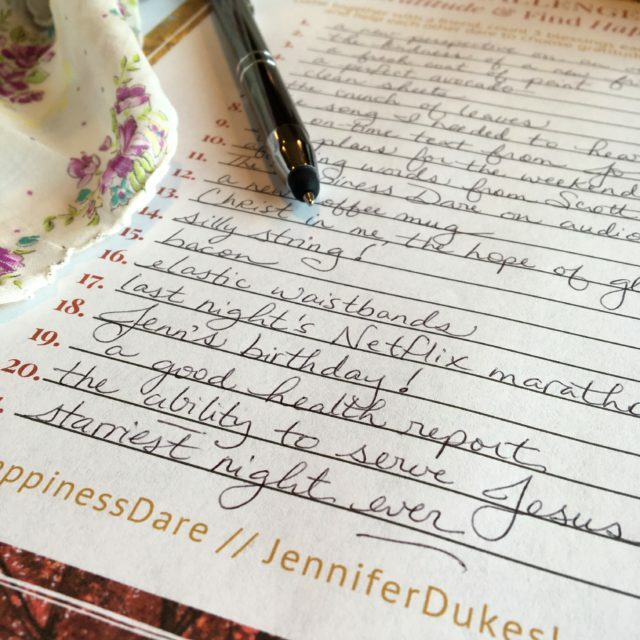 5 – Practice “residual happiness” by reviewing your list every night. Download this graphic to your phone, and share on Instagram. Or share this post on Facebook and Pinterest. Let’s make our gratitude contagious. It was Augustine who said it first: “A Christian should be an Alleluia from head to foot.” Not waist to foot. Not armpit to foot. But head to foot. If gratitude is directly proportional to my happiness, I will be far happier on the days when I am grateful from scalp to toes. All human beings—no matter what they believe about God—have the built-in potential to experience profound gratitude. Secular research consistently points to thankfulness as a foundational piece of happiness. But imagine what it would be like if you had to direct all of your thankfulness to fate or to the thin air or to your “lucky stars.” Without God, you have nowhere in particular to guide your gratitude. But if we know God, we have a tremendous advantage when it comes to gratitude and happiness: We know where to direct our thanks. If we belong to Jesus, we have the ultimate reason to live the Principle of the Head-to-Foot Alleluia (Chapter 14 of The Happiness Dare). We don’t have to be held hostage by our long lists of if-onlys anymore. We can be grateful for life as it exists today, not as we wish it to be. 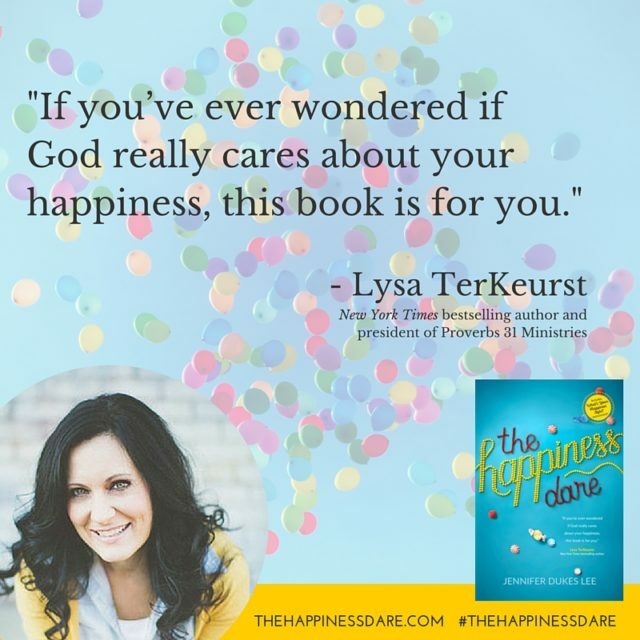 Find out more about gratitude & happiness in my book, The Happiness Dare. Our featured writer this week is Mari-Anna Stålnacke. 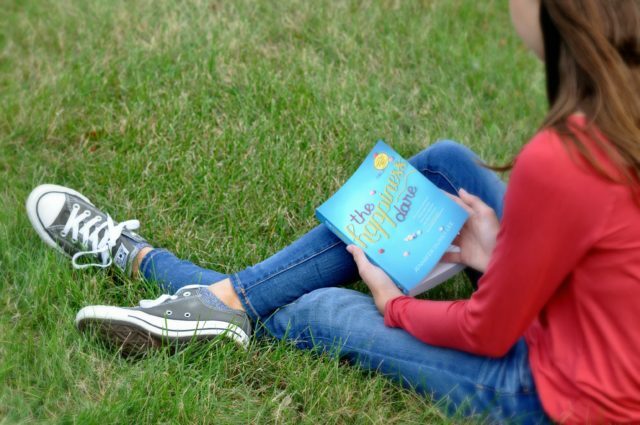 If you’ve read my first book, Love Idol, then you won’t be at all surprised to hear how much I love her blog post titled “You Are Enough.” It might be just the encouragement your heart needs today! Find Mari-Anna here. Days that try the hearts of men, amen? I love your idea and will be doing it – because gratitude always precedes the miracle. Yes, Lord! Love this Jennifer. Joining you. So glad to hear this, Deborah. I love your heart and love this chance to join you in the journey. I love every part of this, Jennifer. I wrote a long draft on almost this very thing today, because my heart felt like it got kicked recently. I have to remember God is sovereign and nothing about that has or will ever change! It is so easy to forget the simple, and I end up taking on the whole world’s problems in my head, which never works. I have found gratitude, and a life of prayer and peace is much more fruitful. I still need reminders. We are fallible humans and God is so good. I can not ever put words exactly to what I feel when I think of how good He is compared to how easily I slip and forget. I do the same thing — “take the whole world’s problems in my head.” I am guessing you are strong in the area of empathy, which is why we tend to do that. We can’t help but feel the feelings of others, whether joy or deep sorrow. 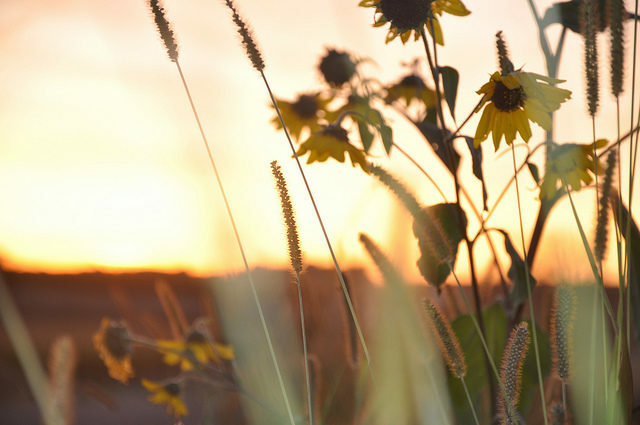 So much THIS: “Gratitude is more than a nice gesture acknowledging the gifts in our lives. It is the stubborn refusal to be held hostage by fear and despair. It’s saying to the world — and to ourselves — that despite everything, this old world is still a beautiful place. No matter how hopeless it all seems, there’s always, always something to be thankful for.” I started doing a weekly blessing list on my blog and it has changed me in so many good ways. I loved this post. ps printing 3 – meeting w/ two besties tomorrow here for lunch – we’ve been meeting for 20 years or so . 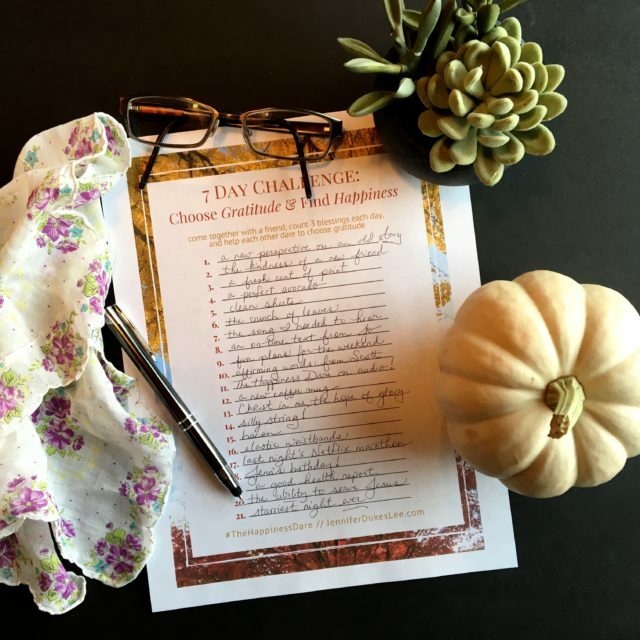 . .
Thanksgiving Day will end my fifth year of keeping a gratitude journal, now a record of 5,000 gifts. Every year I wonder if I should continue. I really can’t stop! It helps my attitude so much! That’s incredible Michele! I lost count of my thanks but I know the day I started. It has changed me — my attitude — altogether. Whoa! That’s impressive. Don’t stop now. LOL! This is exactly why I love November and the Thanksgiving season so much! I’m sharing and pinning … and joining you in a way — I usually start my Bible time with thanks and it makes a world of difference. Especially on the day when I FORCE myself to really think back through the day before and come up with specific, personal details and not the general stuff. I so agree, Lisa. November is always a gratitude reset for me. Printed it off and ready to go! Jennifer, those feelings of panic are all too familiar. I have just went through another bout and I have been praying for wisdom. This is perfect and I’m ready to try and feel the anxiousness wash away! I’m in! I printed it off and am ready to go. I might try doing this with my sisters if they are up for it. Thanks! I agree. 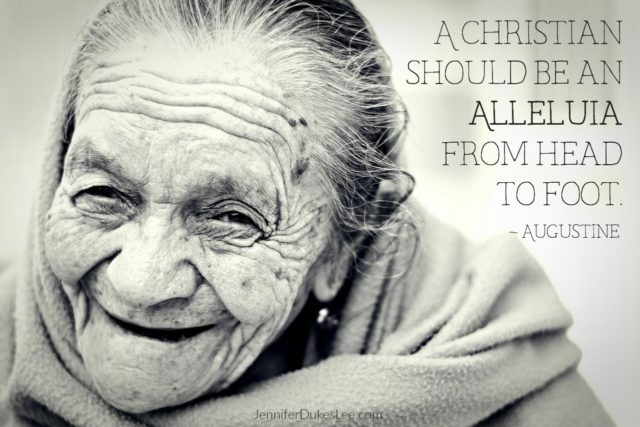 We Christians should be some of the happiest people on earth. My dad taught my in the last few years to actually say thanks you more often to those around me. During visits he would thank me for each meal I made, when I washed his clothes, did small things. He would visit and I would listen to him talk to others and almost always he would thank the person for something during the conversation.Thanks for something they did to help another person, thanks for sharing a story, thanks for stopping to talk. He would find something. This was something he hadn’t done so much before, so I asked him what prompted this new behavior. He said one day he got to thinking and realized people needed to be appreciated and thanked more. He grew up working on the family farm and never heard a thank you. He worked and had a family, and never really heard a thank you. He wanted to acknowledge the work that people do daily and never hear a thank you for. Because of his example, my family says thank you out loud to each other a lot more for the daily small things we do for each other. .
Keeping a gratitude journal has been life changing for me! I’ve been writing down at least three blessings a day since 2009! Almost to 10,000!